Manuel Hall has lived in Portland, OR for 17 years. He is a Community Division Organizer with Common Good Finance, alongside, Jim Newcomer, Julian Lauzzana, Stephanie Mercer and Blake Schmidt, who also serves as Personnel Director. He is also very active in Portland’s improvisational theater scene and performs with Brody Theater and Curious Comedy Theater. When presented with the opportunity to work as a Community Division Organizer for Common Good Finance to start common good banks in Portland, I intuitively knew this organization could be the one to change the rules of how “the game” is played. Common good banks are a timely new paradigm in the financial services industry, with a focus on social, economic and environmental sustainability and justice. I believe common good banks™ will prove to be a unifying force in this era of fragmented neighborhoods and communities. 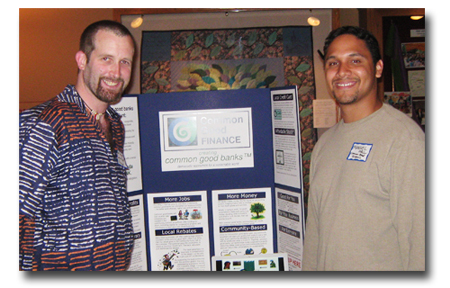 Manuel Hall (right) with Blake Howell Schmidt, Division Organizer, Common Good Finance Corp. Think of common good banks as being like your local cooperative grocery store or worker owned business. They will be integrated into the social and economic fabric of communities whose members lay the groundwork to have their own bank divisions. Thirty community division organizers including myself are working right now in towns and cities in thirteen states across the US to create the infrastructure, gain the support and build partnerships for common good bank divisions. I like Common Good Finance’s use of partnerships with local business and non-profits to bolster its vision of sustainability. The benefits of partnerships are two fold: a common good bank will be able to offer free credit card processing to a partnering organization, potentially saving them thousands of dollars in processing fees. By using existing infrastructures and technologies through these partnerships, a common good bank can exist in any community without having to construct another brick-and-mortar building, thereby preserving resources, staying committed to sustainability and directing more profits back into the community to support schools and non-profits. better world, one community at a time. The most personal example of the positive effect that a common good bank can have would be my own mother, Rosalie Hall. In 2001, when she was in her early 50s, she made the decision to go to college, with the goal of being a counselor to people with addictions to drugs and alcohol. Upon receiving her certification to begin counseling others, she realized that the organizations she worked for did not always share her client-first values. Furthermore as a Native American, she would like the opportunity to target her services to the Native American community. I had suggested to her that it would be best for her to start her own treatment facility, allowing her to more fully realize her own vision of what it means to heal people who suffer addiction. This is where a common good bank would be able to help, recognizing the benefit of my mother’s idea for a treatment facility to the community, and assisting her with the funding to get it started. That’s just one of many stories whose outcome could be greatly benefited by the presence of a local common good bank. Each community has an opportunity to come together and start a common good bank in their own neighborhood. I have met some wonderful people during my time as a Community Division Organizer (look forward to meeting many more), and have discovered like-minded organizations and groups I would have previously not known existed. As we move forward, with the goal of completing the first division in the next couple of weeks, I am excited to see and be a part of the changes that will surely happen as the result of Common Good Finance’s vision of banking for the common good. For more information go to www.commongoodbank.com or email info@commongoodbank.com.